On the Road to Pontelandolfo! Just how much do you pack for three months in Italy? I had it down to three washable summer dresses, three pairs of slacks, one washable dressy dress and five assorted artsy tops. That should have fit in one carry-on. But no! Suddenly, I had one large suitcase, one small suitcase, one carry on suitcase and one very, very large purse. What the heck is in all of those bags? Presents! Since we found our Italian family fifteen years ago, I delight in packing gifts for everyone – that includes children’s books in English. (Beginning in nursery school all students study English.) Plus, my precious niece Alexandra Rose is graduating from the London Academy of Dramatic Arts this July and I had to lug along her graduation prizes. OK, so that bag should come back empty. Nah – it won’t – I’ll buy tante cose while I am in Pontelandolfo. Shoes! I forgot about the shoes! I brought two pair of sandals – no make that three, black pumps, Clark quasi sneaker shoes and those funky shoes that you can walk in water with. The carry on suitcase held a computer, iPad, Kindle, adapters, all sorts of wires, plugs and electrical things plus pads, pens, files, and books. It weighed more than my clothes. The big purse – well that was so stuffed I can’t remember what was in it – but no clothes. Jack carried the Magic Jack – which is a fabulous thing to own. You can migrate your home phone number to it and when someone calls your house in the USA it will ring anywhere in the world. We now use it as our primary home phone and have cut our telecommunication costs considerably. We are so glad we bought the Magic Jack and recommend it highly. His two big bags and one carry on also contained his computer, camera, peripherals, sneakers, two pair of sandals, regular leather shoes, and who knows what else. I didn’t pack it. My awesome godson, Tony, owner of Kennette Productions ( that was a blatant plug-in case you need any video or audio work done) drove us to JFK Airport. We got there in plenty of time to toast our new adventure. The “test” to see if a tiny mountain village is the perfect place to spend our retirement years. We flew “Premium Economy” which means seats that you can actually sit in without your knees in your face and the opportunity to schlep two suitcases plus a carry on. It was an interesting trip. We got to Rome, easily made our connection to Naples, took the cute bus to the plane, got on the plane and smiled at each other. In one scant hour we would be in Il Mezzogiorno. Or so we thought! For about forty-five minutes we sat on the plane. No, they did not serve us wine and olives. They did, however, tell us that we would be taking off as soon as the last passengers arrived. They HELD THE PLANE for someone! No one would tell me who the someone was – yes I did whisper the question. But a very well dressed older gentleman sauntered on casually, took his seat forty-five minutes after everyone else did and we were off. The Naples International Airport (Capodichino) is very manageable. It is small enough to make the end of the journey feel like a family style beginning. You can easily get your baggage and zap out the door. There are buses to Naples and from there you can catch trains to most of Southern Italy’s major points of interest. We have a great family and my cousin Rosella and her husband Pasquale picked us up and whisked us off to what would become our home for three months – Pontelandolfo, BN, Italia. I was on a plane once seated next to a gentleman who contracts with companies to repair their high-tech equipment within 24 hrs of a call. He flies domestically and internationally several times a week at a moment’s notice. So, he pays the highest fares. For his loyalty, Continental (it was Continental at that time) gave him a super high level premium status, one of the benefits of which was that they would hold a plane for him. So, it’s $$. It’s always $$. Have a great time. Am looking forward to reading the blog of your adventures. Ciao. …and how is the wine? Ah, the wine! For 1,30 euro you can drink the finest wine! We went to a great restaurant in a neighboring village yesterday and had a scrumptious meal and a bold red wine. The bottle cost 3,00 euro! Happy to know your adventure has begun well. Looking forward to hearing more as you settle in. This is a great idea, can’t wait to hear about everything you are doing..Don’t let the wine interfere with your writing. What an adventure. So glad to be part of your blog ! Please add Johnny D to your list, if you haven’t already – since you are living HIS DREAM. What an adventure you will have, and what a long way from Flagtown! Enjoy yourself and have a glass of wine for me. P.S. Midgie, your blog rocks! Hi Midge, so glad to be included in this great adventure. Am anxious to hear even the tiny details. Where are you living? How many rooms? Are you sleeping well? Do people talk to you, excluding family of course? Is the Italian improving? Are you shopping and cooking everyday? We rented an apartment that is bigger than my house! You’ll see it on the next post. We have 3 bedrooms and 3 baths, kitchen, dining room, second kitchen and sitting room. We sleep perfectly and people do talk to me, laugh at me, correct my Italian and are wonderful. I do shop almost every day – the family generously wants to include us in their meals too so those days I don’t shop. The food is fresh, cheap and wonderful. Subscribe to the blog and I’ll fill you in on all of that. …great read…keep it up…can’t wait to be there in July! Really, bigger than your house???? Sounds very nice though. I am eagerly awaiting your writing and discovery. I follow your lead and I admire you. May your vision continue to grow and thrive in Italy as well as in Flagtown. This is great! 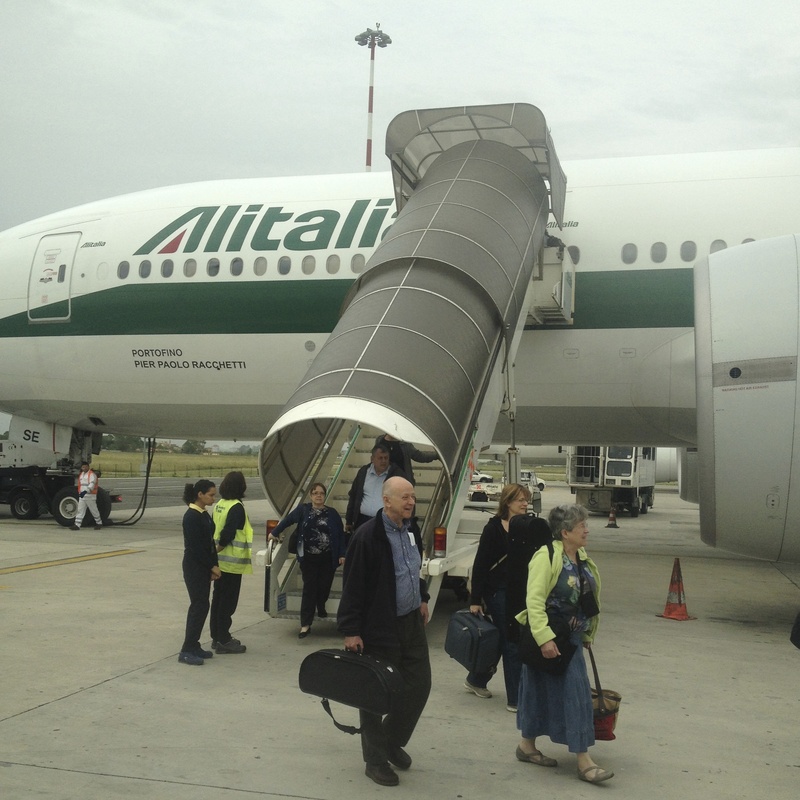 Your Italian adventure has begun! Sounds wonderful Midge. Thanks for sending it. I am picturing your every step as you describe it! Enjoy, and hello to Jack, too. Very Interesting. I want to go to Italy someday. Is it expensive to buy a home there? I am enjoying your Italian adventures with you! Kathi, just like anywhere else in the world prices on houses vary. For fun – and to answer your question – I just googled houses in Potelandolfo and found a list of varying prices. Thanks for subscribing to the blog. Midge, I can’t wait to see the posting with the picture of the “casa”. Glad everything is beginning so well. Looking forward to your blog posts. Ciao. Have a great time. Lots of success with your new play or written work. Thank you for inviting us in to participate and enjoy your journey in Italy. Since I won’t be there this summer, I’m looking forward to reading all about your special adventures. Can’t wait to read more about your 3 wonderful months in the most exciting place in the world for me..Italy, all of it! Hi Midge, glad to hear everything went well. I can’t wait to get to Italy… it’s getting closer and closer. I think I’m going to purchase the magic jack too. I think it’s easier to get calls from here. Well I’ll see you in July in Monopoli in the Puglia Region. I feel like a Magic Jack commercial but it does work. Now, some days when the wind is really whipping around up here we get an interrupted signal. We think that is because the internet is all wi-fi in the whole village. We have a router and an antennae that picks up the signal from a master tower connected to the internet. Looking forward to seeing you. day Italian living. Regards to Jack. I am looking forward to your entries. Be well and enjoy. Sounds like quite an adventure! Love your place in Potelandolfo but find your blog confusing. You just got there are you’re involved in elections???? Write more about the logistics of living there — or send me an e-mail. Good luck and have fun!!!! Sounds like you leaped into the political fracas and missed some of the earlier posts. I promise more to come on living the village life. Just found your blog…we are foretekyonally@rcn.com and checked the aol account and finally found you! So glad we did! Glad to have you on board. Did you subscribe ? yes! Will stay up on your news!